You guys probably know that I am obsessed with my dogs (all 7 of them), but one in particular is especially close to my heart. Waffles is the funniest, sassiest little goober who has her own Instagram (@wafflesnotwaffle). My mom found her when she was buying tires and I picked her up at the tire shop and it was love ever since. Since I've been traveling so much, hopping on a plane almost every other week, it's been really hard for me to cope with not seeing Waffles every day. 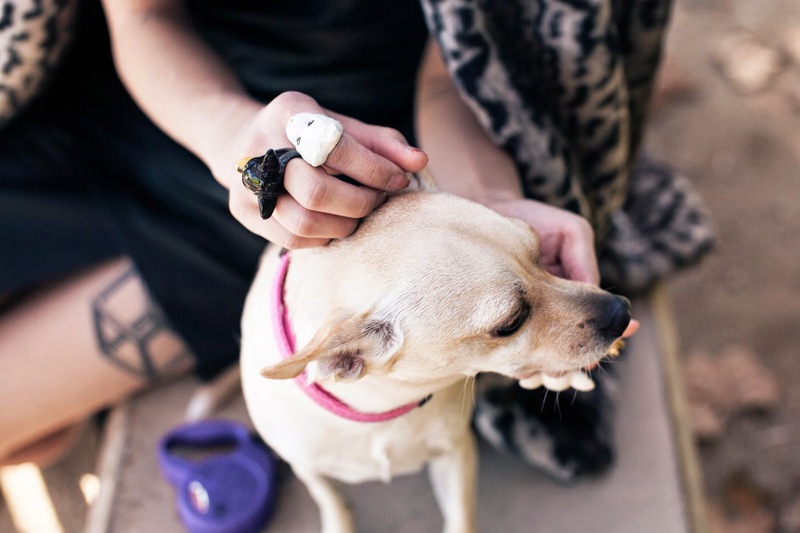 Sentimental pet jewelry helps me keep my pups close. I discovered Good After Nine at Chatuchak Market on my last trip to Bangkok and I fell in love! They have the cutest handmade jewelry and their dog pieces are especially adorable. 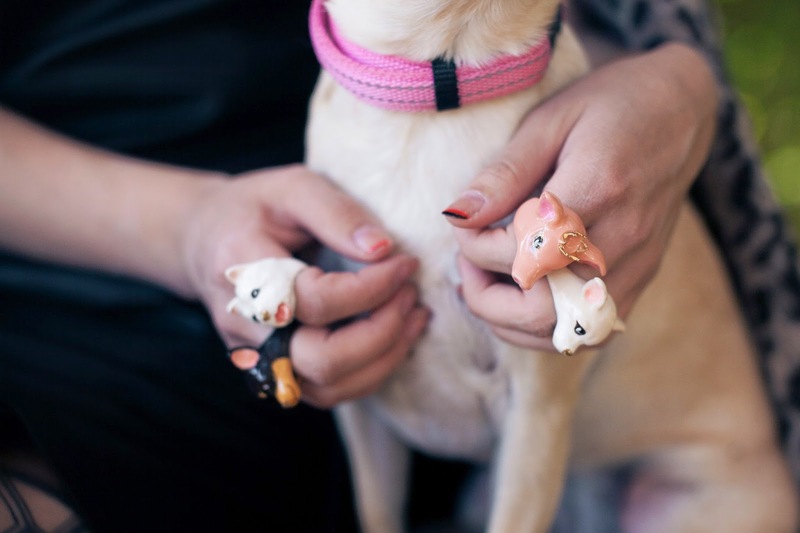 I got a white chihuahua for Penelope, a black chihuahua for Tatiana, a white westie for my scruffy not-a-Westie-but-close-enough mutt Napoleon, and a king pig ring for my fat, snorty, HBIC chihuahua Bella. Waffles gets to be close to my heart, literally, with a delicate, minimal silhouPETte silhouette necklace that has her name engraved on the back. SilhouPETte is an especially commendable brand because they give a huge 30% of profits to rescue and rehabilitation efforts for animals in need both locally and and nationally. I'm really proud to be a patron of such an amazing company. 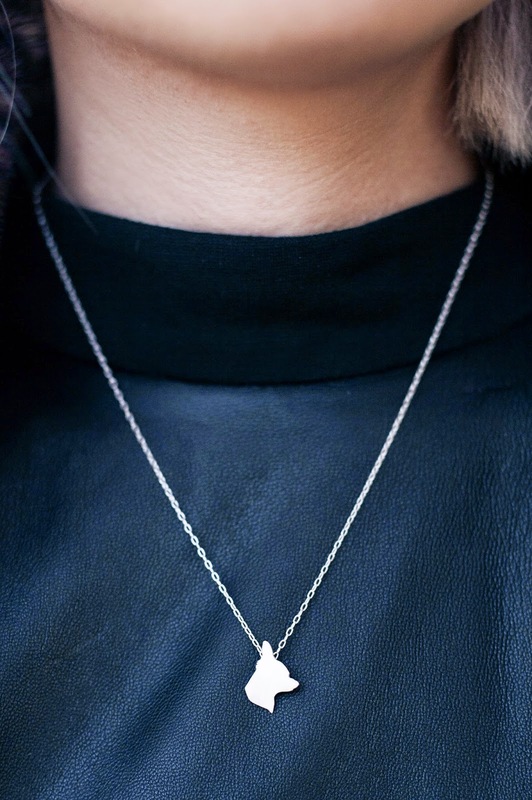 If you ever needed that staple minimal necklace, this is a unique way to style every outfit. Good After Nine creamy chihuahua ring. Good After Nine brownie chihuahua ring. Good After Nine whipcream westie ring. Good After Nine prince pig ring. Bless'ed Are The Meek dress. This is adorable, such a cute pup! And I'm getting total hair inspiration from this post, so perfect. She is gorgeous! Love these photos, your fur coat is lovely! Lovely photos, Waffles is so cute!! Love the coat! And I love finding businesses that give to charities or do community service.